Public outcry over tax havens has increased in recent years. Journalists have shed light on the users of these offshore financial centres (OFCs), as well as the jurisdictions, banks, accountancy and law firms involved: OffshoreLeaks (2013), LuxLeaks (2014), SwissLeaks (2015), the Panama Papers (2015) and BahamasLeaks (2016). OFCs are popular instruments for multinational corporations to (legally) reduce their tax bill by moving capital across borders in the form of dividends, royalties and interest by taking advantage of loopholes in the legislation. By playing out one state against another, corporations may reduce their tax rate from around 35% to 15-25% (and some much lower). For instance, Apple uses a combination of subsidiaries in Ireland, the Netherlands and Bermuda to strongly reduce its tax payments in Europe to a stunning 0.005% in 2014 according to the European Comission. If profits would be accounted for where the economic activity takes place, multinationals would pay at least US$500-650 billion more on taxes, according to estimates by the Tax Justice Network and the International Monetary Fund. From this, around US$200 billion relates to developing countries, which means that developing countries lose more capital in tax avoidance than receive in development aid (US$142.6 billion). What countries are Offshore Financial Centres?Given this contested role of OFCs it is surprising that we still lack a broadly accepted definition of what makes a country an OFC. Instead, the identification of OFC jurisdictions has become a politicised and contested issue. International organisations such as the OECD or the IMF have published lists of alleged tax havens (OECD list, IMF list), but the chosen criteria remained heavily influenced by politics. To remedy this lack of transparency, we developed a novel, data-driven approach that identifies OFCs. We simply ask which countries or jurisdictions play a role in corporate ownership chains that is incommensurate with the size of their domestic economies (see Zoromé 2007). Our results show that offshore finance is not the exclusive business of exotic small islands far away. Countries such as the Netherlands and the United Kingdom play a crucial yet previously hidden role as conduits of offshore finance on its way to tax havens. Early attempts at OFC identification have resulted in for instance the Tax Justice Network’s “Financial Secrecy Index” and Oxfam’s list of the worst corporate tax havens. Jan Fichtner’s “Offshore-intensity Ratio” provides a helpful rough yardstick to judge which jurisdictions act as OFCs by describing the proportion between foreign capital (such as FDI) and the size of the domestic economy. However, these measures do not allow us to differentiate if foreign investment reported by Bermuda originates in the Netherlands, or if in contrast it originates in Germany and is routed through the Netherlands. We still don’t know how offshore finance flows across the globe. To overcome these problems we move from country level statistics to large scale company data. The coming together of political economists and computer scientists in the CORPNET research group at the University of Amsterdam made it possible to study how corporations make use of particular countries and jurisdictions in their international ownership structures. We analyzed the entire global network of ownership relations, with information of over 98 million firms and 71 million ownership relations. Note that here we are interested in how OFCs cater to the needs of multinational corporations, and not private individuals. Unlike previous attempts at identifying OFCs, this granular firm-level network data allowed us to identify and distinguish what we call “sink-OFCs” and “conduit-OFCs.” With some surprising results. British Virgin Islands, Bermuda, Jersey and the Cayman Islands. Indeed this replicates earlier lists of tax havens. But in addition our method confirms for example that Taiwan is indeed an “un-noticed tax haven“. Using our method we can now also investigate which jurisdictions are used by corporations en route to sinks. These conduit-OFCs are attractive intermediate destinations and enable the transfer of capital without taxation. Surprisingly we found that only five big countries act as conduit-OFCs. Together these five conduits funnel 47% of corporate offshore investment from tax havens, according to the data we analysed. The two largest conduits by far are the Netherlands (23%) and the United Kingdom (14%). They are followed by Switzerland (6%), Singapore (2%) and Ireland (1%). In our detailed research article, “Uncovering Offshore Financial Centers: Conduits and Sinks in the Global Corporate Ownership Network” we also show that each conduit jurisdiction is specialised geographically and in industrial sectors. 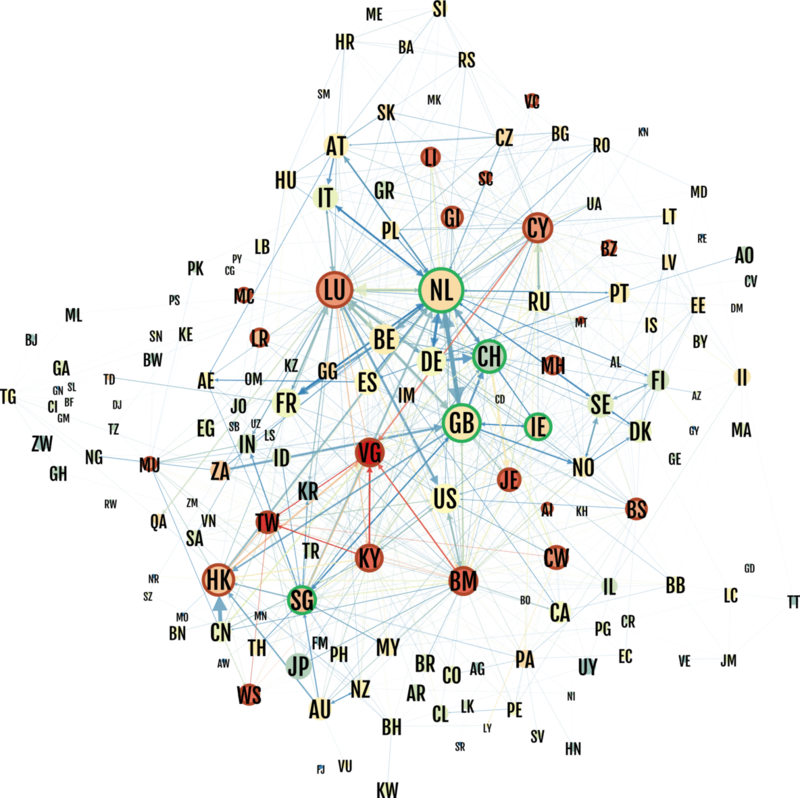 Figure: Network of relationships between countries. Conduits are marked in green, sinks are marked in red. The size of the country is proportional to the investment flows through the country and the colour to its position as a sink (blue = no sink, red = sink). The size of the arrows is proportional to the investment between two countries and the colour to its importance (blue = lower flow than expected, red = higher flow than expected). Offshore Financial Centers are often portrayed as small, exotic, far away islands that are difficult if not impossible to regulate. We show that many OFCs are in fact highly developed countries. 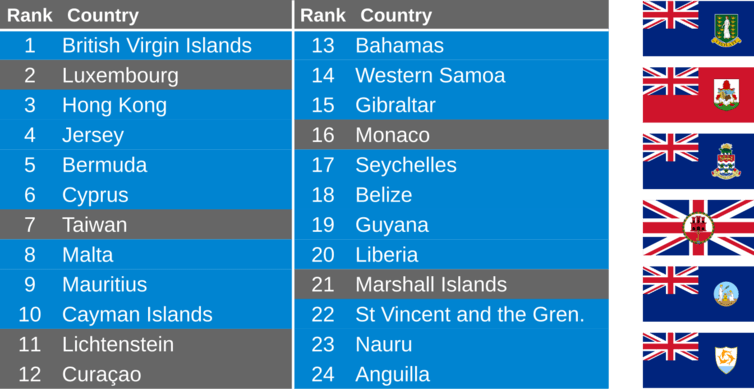 18 out of 24 sink-OFCs have a current or past dependence to the United Kingdom, which highlights the central role of London in offshore finance. The finance minister of the United Kingdom has speculated that the UK may become a tax haven of Europe after Brexit if not offered a good deal by the EU. Yet today, many of the UK overseas dependencies (such as Cayman Islands, Bermuda, British Virgin Islands or Jersey) already act as large tax havens. Since the financial crisis, the EU and the OECD have increased pressure on tax avoidance, with modest effects. We hope that our approach can help regulators target the policy to the sectors and territories where the offshore activity concentrates. In particular, targeting conduit-OFCs could prove more effective than targeting sink-OFCs, since – while new territories with low or no corporate taxes are continuously emerging – the conditions for conduit-OFCs (numerous tax treaties, strong legal systems, good reputation) can only be found in a few countries.